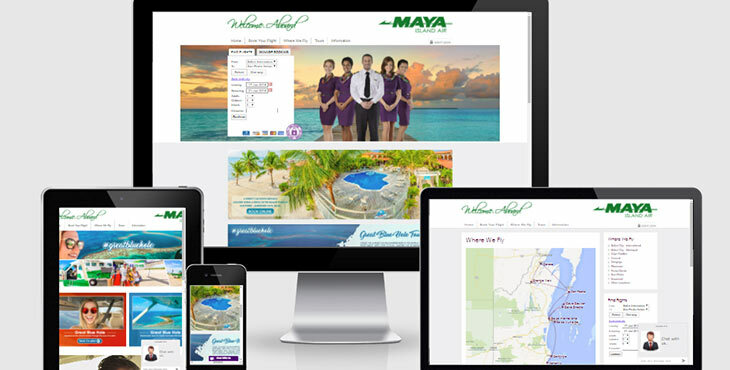 Maya Island Air Site takes flight with Belize Internet Marketing! Belize Internet Marketing & Website Design proudly announces the launch of a new site for Mayan Island Air. This well known local/domestic airline takes flight with a new bolder, brighter design, a modern layout that ensures ease of navigation and allows the user to reach his or her destination page quickly. Mayan Island Air is well known for it’s reliability and capability. When you fly with them you will reach your destination on time and safely. They offer daily scheduled flights to many of Belize’s popular tourism destinations, including San Pedro Ambergris Caye, Placencia, Hopkins and many more. They are also the gateway to many of Belize’s private islands, seaside resorts and mainland activites unique to Belize.